Please don't be offended, but for security reasons, pages with live person references and/or too much security related information are restricted. When you click on some links, you may be asked for a username and password. For access, email me at ray@shasteen.com, tell me who you are and why you want access and in all likelihood I will send you the username and password. I really do want to work with any of you that are interested. Information in restricted areas includes Pedigree, Lineage, & Descendancy Charts, Old Photos, and Other Memorabilia from Shasteen Relatives & Cousins, etc. I am slowly migrating some of the information to RootsWeb, but will maintain the bulk of my information separately. I have uploaded the GEDCOM file for James Shasteen, b 1755-60 to World Connect. I have worked on the Shasteen line off and on since the '70s, initially collecting what I could from my parents and immediate relatives. During the '80s I corresponded with extended and suspected relatives. Then in the '90s I began doing some limited research at the Clayton Genealogical Library in Houston and requesting some microfilm from the Family History Center (Mormon Church). During that time I was a member of an organization, The Pierre Chastain Family Association, named after Pierre Chastain, a French Huguenot, who came to Virginia via England in 1700. This line has been researched quite extensively and supposedly, most Chastain, Shasteen, Shastid and related spellings descend from this man. (There are rumors of other Chastain/Shasteen folks having snuck into the country in the 1700's that our line may have sprung from.) The Shasteen spelling apparently was derived from English tax collectors and census takers in the 1700's spelling the name phonetically as it was spoken by the French descendants. The research, though time consuming, was fascinating. Seeing copies of tax rolls, deeds and other documents (handwritten in almost a calligraphy) from the 1700 & 1800's was spellbinding, particularly when it related to one of your ancestors. For those of you that have not done much genealogy, a primary issue is the burning of so many of the courthouses in the South during the Civil War and the resulting loss of so many records. This alone will possibly result in never determining our lineage definitely. Irregardless, our Shasteens are a documented part of settling of this country: the assumed Pierre and the unknown father and grandfather of the five brothers from 1700-1810 in early Virginia (statehood 1788), the five brothers in central and northwest Ohio (statehood 1803) in the 1830's, Robert's wife Nancy, son Robert, and daughter Nancy (married to James Beaver) in Illinois (statehood 1818) in the 1850's, Charles Harrison Shasteen and his sister Nettie in Kansas (statehood 1861) in 1887. The bottom line is that I have traced my lineage back to 1790-1792 with two or three James Shasteen's in Amherst County, Virginia, living on the banks of the James River. (Only two show up at any one time, but three designations are given.) However, there is no direct tie to the Pierre Chastain lineage. I am confident that I accurately traced my Shasteen line back through Colorado, Kansas and Ohio to Amherst County, VA in 1790-91 to three James Shasteen’s living on the banks of the James River. The James referred to as “J River” was the father of the five brothers (Robert, James, William, Edmond and John) that migrated to Ohio. I'm convinced, but can not yet prove, that the James known as "Buff" on the 1791-92 tax rolls is the brothers grandfather. James known as "Pedlar" on the 1790 tax rolls and his brother Jesse are probably nephews of James "J River". If you look at the schedule in my working file, Jesse (first column) in 1791 showed up later in Kentucky and he had a brother James in Virginia. The James’ in columns 2-4 are labeled based I believe upon locations, “Pedlar” for a river or hills, “Buff” for a river or hills, and “J River” for the James River. "Buff" and "J River" may be the same and were just labeled differently based on where they lived and who was doing the tax rolls. • the tracing of the members of the family I did using subsequent census and other records. But this is all a longer story saved for later. So in the late '90s, unable to productively proceed with any anticipated success I put research on hold, hoping that someone would unearth some information that would clarify the connection. So far I have not been successful in tracing the lineage further back. I believe two of them may either be the same, or father and son, and all are related in some manner at minimum. In the 1990s I worked closely with the genealogist for the Pierre Chastain Association, Gerry Buland (now deceased), and with the librarian Frank Ellison, Jr. (now deceased), both of whom sincerely wanted to tie in the “unplaced” Chastains/Shasteens. I reached the conclusion that I would have to wait for more data to surface from the research of those that had better access to Virginia records. There are a lot of Chastain/Shasteen lines that seem to not tie in to Pierre. Anyway, a lot of detail looking at cemetery’s, death records, etc. has been done and it is just going to take something special to establish further lineage, if it is ever successfully established. Gathering and organizing this information became a real issue, initially due to the paperwork, followed by the computer files and various types of computer formats. After several difficult computer software migrations, I settled on using a Microsoft Word file as my primary storage site and created a file which is available on request. I have duplicated a lot of the information in a PAF file which I can print basic charts from. The Word file is not exactly the easiest file to follow, but why should it be? No one made it particularly easy for me. It also represents a work in process, so no telling what you may find from time to time. Now at the end of the first decade of the 21st century, I am rechecking for additional information that may have surfaced, updating the documentation for further connections to “cousins” and am amazed at how much easier the basic research is. If you have any suggestions, see any errors, have any pictures or information that you would like to share, please contact me. James Shasteen, b 1755-60 — Married Phoebe Padgett 18 Apr 1782 Amherst Co. VA. In 1787 in Rockbridge & Amherst Counties, VA, circa 1830 in Ross Co., Ohio. Married Eleanor Ryan 12 Sep 1829 in Ross Co. OH and lived most of his life there. William Henry Harrison Shasteen, circa 1841-1916 — Ross Co., Ohio, living most of his life there. 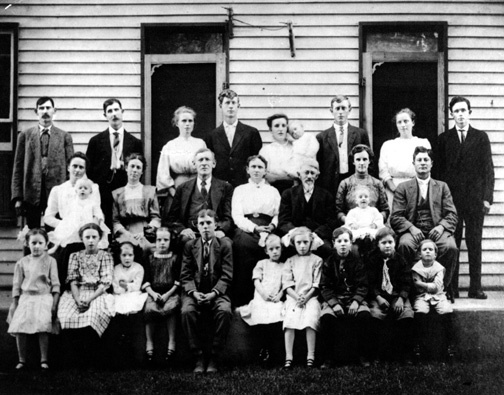 "Great Granddad — Family Reunion of 1911"
Persons names who are in the photo are bold, followed by approximate age at the time.